An article popped up in my newsfeed about the liquidation of a Hull based electrical contractor that had been long established - it's always sad to hear of a long standing businesses failing. A few of the circumstances that lead to the liquidation stood out to me, as potentially soluble, which I thought worthy of comment, perhaps as advice to others in a similar situation. The article said that they had an 80% turnover reliance on a single contract. Obviously this is not an ideal situation, that type of reliance exposes your company to anything that affects your prime debtor. For example, a deterioration in the cash flow of your debtor or a dispute could be serious issues for your company. Having said this, we have secured funding for many companies that only have a single customer, or just a handful of customers. We always advise clients to seek to broaden their customer base, and we have introduced a marketing agency to some clients to help them gain new contracts. Anyway, the article went on to say that a pricing error, affecting their prime debtor, caused them cash flow problems that led to their liquidation. This demonstrates very clearly the issue or relying on one single customer. Even if they customer is financially sound, and you don't have a dispute, this type of error can't be predicted. Many construction sector companies use quantity surveyors to help them price jobs, this was not mentioned in the article, but it can be common practice to minimise the possibility of these types of errors. The cash flow problems may have been helped with construction sector finance. It was not clear if the company had received this. They had granted a charge to a high street bank relatively recently, but the bank didn't show in their creditors list (in the statement of affairs from the liquidation) so perhaps not. Their statement of affairs did show 136K of "applications, retentions & book debts", however the expected realisation value was stated at just £24K. There was no explanation of the reasons for the shortfall but it is common for such assets to yield lower realisations in a liquidation situation. 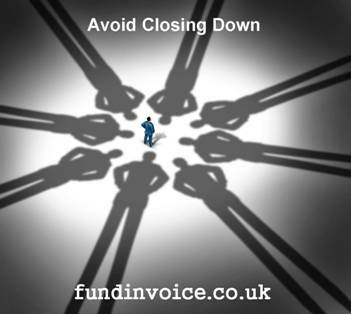 Customers can dispute invoices or site non completion of contracts as a reason not to pay in full. There were no details in this case but the low realisation reinforces why companies that provide contract finance tend to use quantity surveyors in order to value the book debts, before they fund. So all in all a sad story of a construction sector business failing. Particularly with an anticipated shortfall to creditors of nearly £400K, according to the statement of affairs filed at companies house. However, there are a few issues that may have been mitigated, to avoid liquidation, if they had taken a few alternative steps, early enough e.g. seeking other contracts, avoiding pricing errors and improving cash flow with construction finance.